Super Savings Item! Free Shipping Included! Save 39% on the Hillsdale Furniture 1687BFR Ruby Bed Set with Rails, Full, Textured White by Hillsdale Furniture at Indsight. MPN: 1687BFR. Hurry! Limited time offer. Offer valid only while supplies last. Feminine with an air of lightness and whimsy. the ruby bed take its inspiration from its elegant fleur di lis-adorned headboard and footboard. Feminine with an air of lightness and whimsy. the ruby bed take its inspiration from its elegant fleur di lis-adorned headboard and footboard. 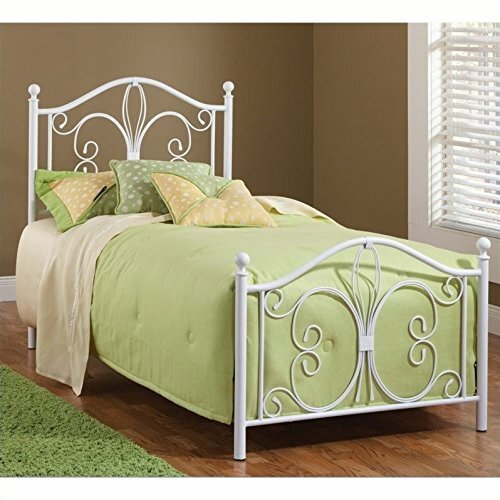 available in a delicate textured white color and fits on full size bed. set includes one headboard and one footboard with rails. some assembly is required. headboard measures 49-1/2-inch height by 54-inch width by 2-inch depth. footboard measures 30-1/2-inch height by 54-inch width by 2-inch depth.